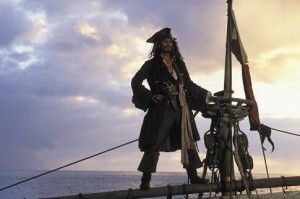 The Pirates Of The Caribbean: The Curse Of The Black Pearl - Movie Review - Are You Screening? If you happened to contribute your dollars to the slightly under $10 million amassed by 1995’s Cutthroat Island, you don’t have to wonder what went wrong with that movie. What went wrong, that is, that turned that movie into the biggest money loser of all time (It has since been surpassed, and resides at number five on the list). The swashbuckling, pirate adventure, once a mainstay of Hollywood, was reduced to a joke, and the near ten-year drought that has followed shows the curse bestowed on the genre. But, it seemed like a good idea at the time. People (historically) love a good pirate story, and there were recognizable names involved. There were great sets, gorgeous ships, and something over $90 million thrown at the thing. The problem was it was just no damn fun at all. 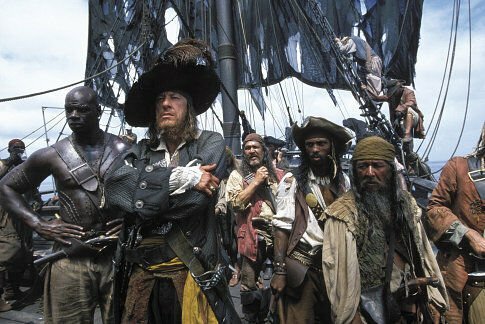 With Pirates of the Caribbean: The Curse of the Black Pearl, Disney takes its first stab at movies named after its own rides (Eddie Murphy in The Haunted Mansion coming soon), but more importantly, it takes a stab at lifting the curse on pirate films. It succeeds. Our story (which is slightly too convoluted for its own good) opens with a British ship happening upon the wreckage of another. 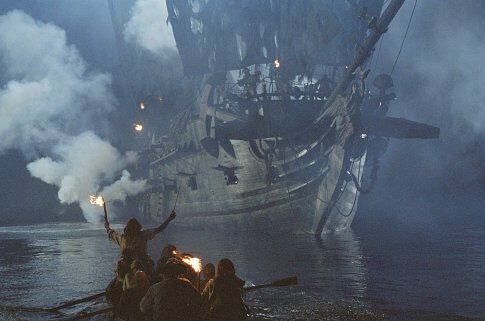 The captain of our ship, Norrington (Jack Davenport), is transporting Governor Swann (Jonathan Pryce) and his daughter to Port Royal when we come upon the wreckage and find a boy floating in the debris. The boy has a medallion which (to the girl at any rate) marks him as a pirate, so she takes it. An uninspired, but serviceable introduction. We leap ahead a number of years, and find that the boy, Will Turner, has grown into Orlando Bloom, and the girl, Elizabeth Swann , has grown into Keira Knightley. Will is now a swordsmith, and Elizabeth is firmly established in her mansion as ‘The Governor’s Daughter’. Gallantly surveying the horizon from the crow’s nest of his… dinghy, Captain Jack Sparrow (Johnny Depp) sails into our film, wind and spray in his face, jovial ‘bad guy who’s good’ spirit in his heart. Meanwhile, we visit young Elizabeth as her father attempts to nudge her toward marrying Norrington, who is being made a Commodore, but we are made aware that she has feelings for Will. Yes, it’s that story. After a few scenes allowing Captain Jack to display his ‘escapade’ ability (and get caught), we discover that his arrival at Port Royal is very fortuitous. A few short hours after he’s finally put behind bars, the legendary Black Pearl arrives, drawn by the medallion to Elizabeth. Invoking the right to parley, Elizabeth is taken aboard the pirate vessel, and meets Captain Barbosa (Geoffrey Rush). 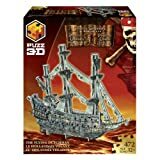 The Black Pearl sails off with Elizabeth, and Will and Captain Jack must join forces in order to go after her. 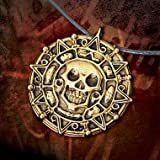 The plot twists and turns, never straying too far from the eventual goal of giving the undead, cursed pirates aboard the Black Pearl their comeuppance, but getting dangerously close at times. There is plenty of old-fashioned, swashbuckling action, but some of the scenes go on a bit too long, and that’s precisely where the movie itself has its main difficulty. A good sword-fight scene can be ruined if the advantage flip-flops too many times. ‘Building tension’ soon becomes ‘being silly’. Pirates doesn’t go too far, but that is certainly its weakness. It tries to do too much, and in so doing, does a little less. It is still anything but a wasted effort, however. It is, perhaps, merely a Verbinski effort. Gore Verbinski, though not long on the scene, has already established himself as a ‘safe’ director. The kind of director who can make something as good as it seems on paper (but no better), with minimal risk that he’ll make a complete mess of it. Pirates is a pretty good movie, and I’m willing to bet that it looks pretty good on paper, but it is lacking a certain something which would put it over the edge and into the category of something that could really grab you. My guess is that what it’s missing is the touch of a director willing to take a chance and do something that could go wrong, but also could be great. Depp, Bloom, and especially Rush are the stars of the show, and they are responsible for the fun and enjoyment to be found here. Depp builds a character uniquely his own despite the fact that he plays a cinema staple (the pirate who is not such a bad guy after all, despite swimming in a sea of pirates who are just as bad as everyone thinks). Bloom is almost too good at times, acting at a level somehow strikingly above, and removed from, the genre. I suppose that’s actually bad acting in a sense, but it’s hard to call it that. Rush, had the movie achieved the ‘long-lasting great’ status of its potential, might have become one of the all-time villians. A good deal of credit must also go to two, somewhat surprising, supporting characters. Lifted from BBC comedies, Jack Davenport and Mackenzie Crook deliver performances that are most welcome, especially considering the alternative directions we might have gone. Davenport (of the BBC’s Coupling) manages to bring out a Norrington that, despite the script naming him ‘cardboard, stuffy, British Captain caricature’, can actually engage the audience to some degree. Crook (on BBC’s The Office as Gareth Keenan), half of yet another Bert and Ernie, gag, sub-plot (or should I say ‘routine’) puts a lively spin on what might have become very old, very quickly. He also shows us how you can pull off a ‘chase your eye as it rolls away from you’ gag, and I don’t think it was a very veiled poke at Minority Report. I had to smile at Pirates, or more precisely, at the curse within the film. The curse has lasted ten years, and all you have to do to free yourself from it is give back the gold, and give up some of your blood. You just have to smile at that. So, is the curse lifted? Well, no one in the film says that lifting the curse makes you great. It just lifts the curse. Pirates isn’t a great movie, though it could have been, but it’s full of fun, and for a fairly light, ‘Summer’ movie, this is about as good as it gets. There are definitely some things missing, and overall it feels too long. Maybe it even tried a little too hard with its story. But, I think we’re safe to have another pirate movie in less than ten years. Though I may sound generally negative toward the movie, it’s only a form of sour grapes. I had hopes, and the movie didn’t quite live up to them. But, I was looking for great, and only got quite good. There is a lot of fun, solid characters, great visuals, and even fight-scene banter that harkens back to the days of the great swashbucklers when ‘fight-scene banter’ wasn’t, by definition, a negative. Pirates may be lacking in some areas, but it is enjoyable enough that it’s quite easy to forgive. It’s slick action without insulting your intelligence, and a workable story that doesn’t bog down. The movie, in fact, may well be compared to its namesake. A ride which, despite being decades old, somehow uninteresting looked at objectively, and surrounded by countless ‘cooler’ choices, is nevertheless unendingly popular. Pirates is probably not the sort of movie that is going to have you marking your calendar for the day you can own it on DVD (and you had hoped it would be), but I don’t think you’ll be disappointed.